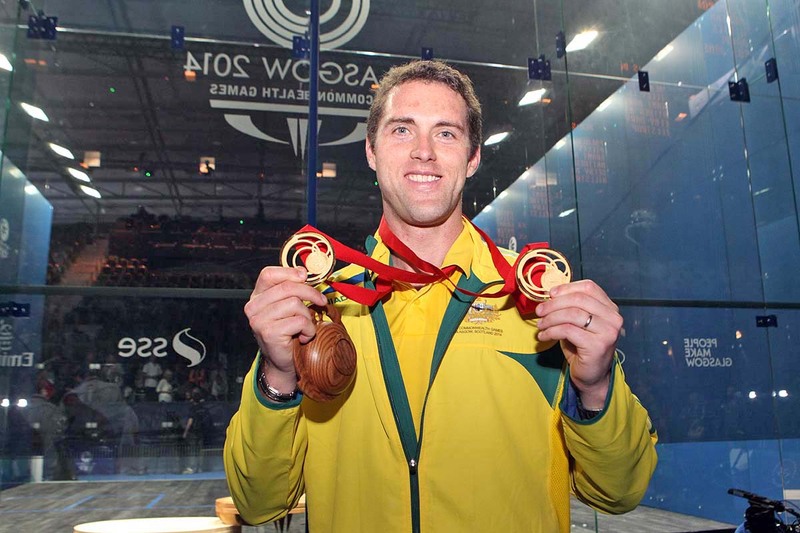 A fairy-tale climax to David Palmer's comeback appearance in the 2014 Commonwealth Games in Scotland saw the illustrious Australian veteran win two gold medals on the final day of Squash action at the Scotstoun Sports Campus in Glasgow. The 38-year-old former world number one and world champion retired from the international circuit three years ago. But, despite having a then record six Games medals to his credit over four events since 1998, Palmer was looking for a first ever gold. 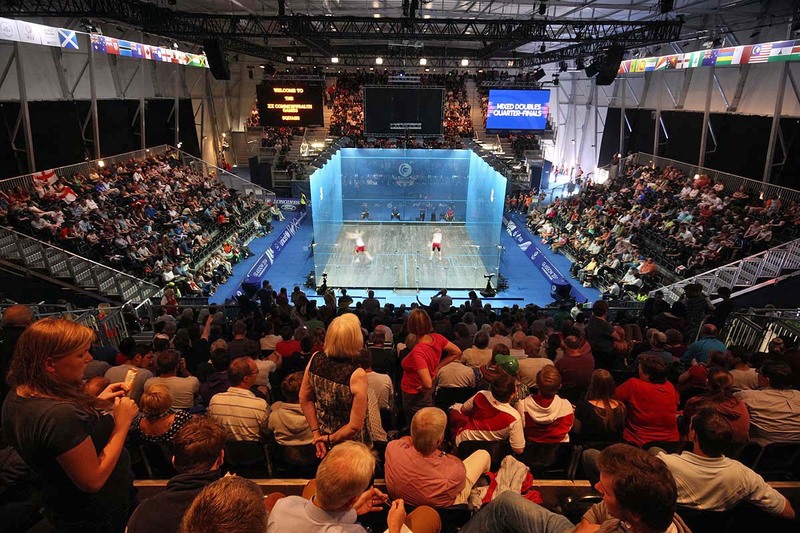 Minutes after winning gold in the mixed doubles final with Rachael Grinham on the spectacular all-glass showcourt surrounded by a capacity finals day crowd in excess of 2,000, Palmer was back on the court with world No20 Cameron Pilley to do battle with English pair Adrian Grant and Nick Matthew, the defending champions eager to maintain England's 16-year grip on the men's doubles gold medal. Grinham & Palmer beat England's Alison Waters & Peter Barker 11-8, 11-10 - then recovered from losing the first game in the men's final to beat Matthew & Grant, from 1-4 down in the decider, 10-11, 11-7, 11-9 in a mighty 80 minutes. The second triumph takes Palmer's total Games medal haul to eight - a new record. "I think that's it now," said Palmer when asked if he might compete in the 2018 Games in his homeland. 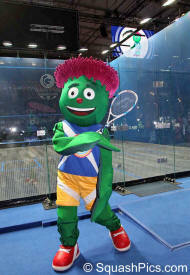 "I hope I will be at the Gold Coast Games - not as player, but watching! "I've achieved what I wanted to - it's a dream come true. "Before we arrived, I thought I had a better chance in the mixed with Rachael as we read each other's games well and her variation and style suits my game," explained US-based Palmer. 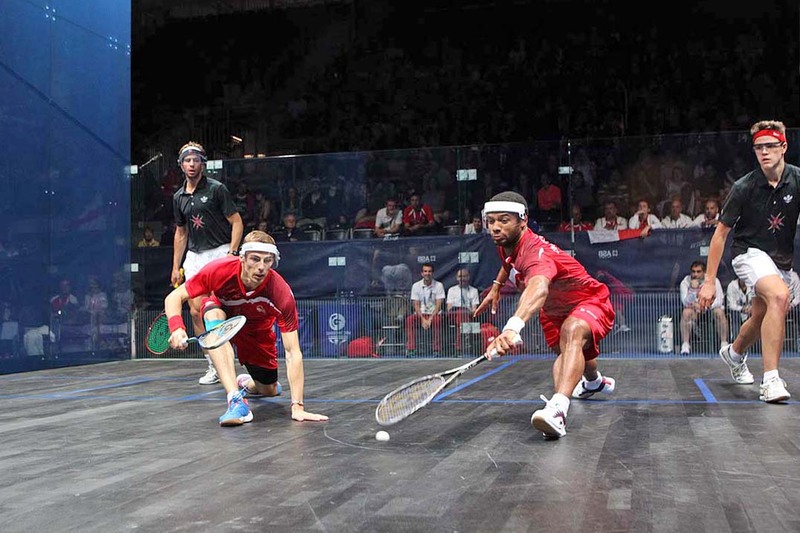 "The men's was always going to be tough as England have dominated the event since the beginning and Nick and Adrian are so strong - we knew it would be a huge effort to beat them. "We were trying to hang in there in the third game, and I dropped off the pace a bit - but Pilley really stepped up and hit some incredible shots. "It was good that we got off 2/0 in the mixed - especially as they really got off to a good start in the second and were really focussed. "It was better to keep going," said Palmer when asked about having to play the two matches back-to-back. "I had a quick shower after the first match to freshen up. "I knew the schedule would be tough but I didn't play the singles - I enjoyed the first week watching the matches - Nick and James's singles final was a great match. "It probably was the toughest day of my life - especially at 38 - but in the end I got over the line. 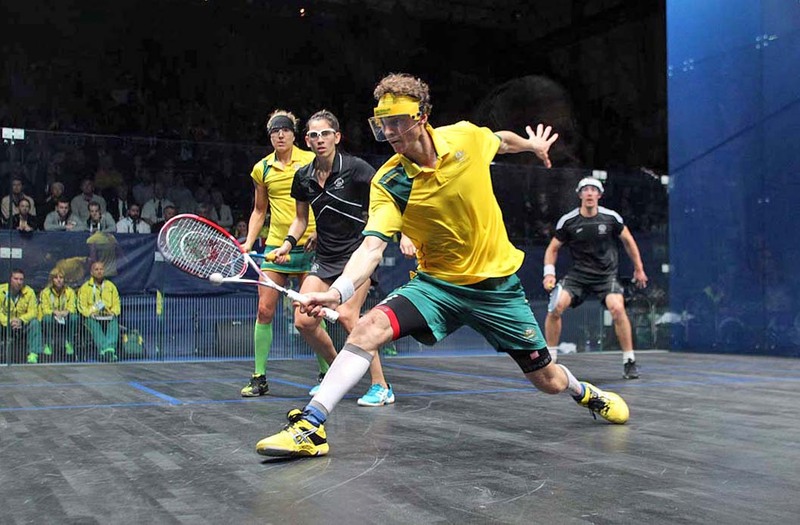 "This is great for me personally - but I hope it will also help Squash Australia. Winning two golds should help the funding," concluded the double gold medallist. Matthew, the world No2, said after the match: "I thought the good start in the final game was going to carry us through but you can second-guess every shot in doubles. "We did ourselves proud, we put our game plan into practice - but they pulled off two great shots to win. "It's been amazing here right from the word go. It's the best Team England I've ever been part of - the spirit of the team has been fantastic. The fact that I carried the flag at the Opening Ceremony still gives me goose-bumps - it was a pity not to end on a high. Next week will probably be a bit of a comedown. "I think the doubles came out well - with a lot more credit than it had in Delhi. Doubles is now on a high after that." Team-mate Grant added: "Credit where it's due to the Australians, they fought hard and we fought hard - that's what the crowd wanted to see. Everyone was excited to see the doubles." After her gold medal success in the mixed final - a win which takes her all-time medal tally to seven - Grinham said: "Doubles is so different - you can't relax for a minute or it'll get away from you really quickly. "I think I played really well considering. They put us under a lot of pressure. "David and I have played together so much - we've even won British Opens together! We're a bit older than the others - but to finally get this gold together is quite special for us," added the 37-year-old Queenslander. 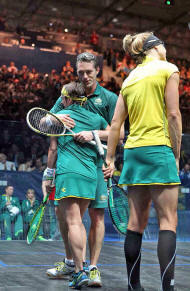 Barker and Waters led 9-5 in the second game of the mixed final and were unable to convert three game-balls. "We are disappointed to not convert that lead in the second game," said Londoner Barker. "We played well throughout but in the first game they just hit some unbelievable winners. "We've got no complaints. I actually think we played the best we've played all week but they were just better. I felt it was a really good final - how doubles should be played!" Waters added: "The Games have been absolutely brilliant, we have had a lot of success as Team England and I have loved playing here." 8-11, 11-9, 11-8 in a repeat of the 2010 final. "We won from a game down last time," said Brown. "I really wanted to come away with a medal here." Pilley added: "We were confident going into the second. I am so happy." The other bronze match saw England pair 11-9, 11-7. It was a bitter blow for the Scots - massively supported by the vociferous crowd - who also finished in fourth place in Delhi. "We are absolutely gutted," said Leitch. "We came here for a medal." A jubilant Selby, now with a first Commonwealth Games medal to his credit, said: "It's the biggest two weeks of my career - it's what I wanted, a Commonwealth Games medal. This is our Olympics. "It's a pleasure to share it with James - we've both put in a lot of hard work for this. We picked ourselves up from yesterday when we were punished." David Palmer (Aus) had won 6 medals before these Games (an equal record) - but no gold.....now he has 8 medals and 2 gold! 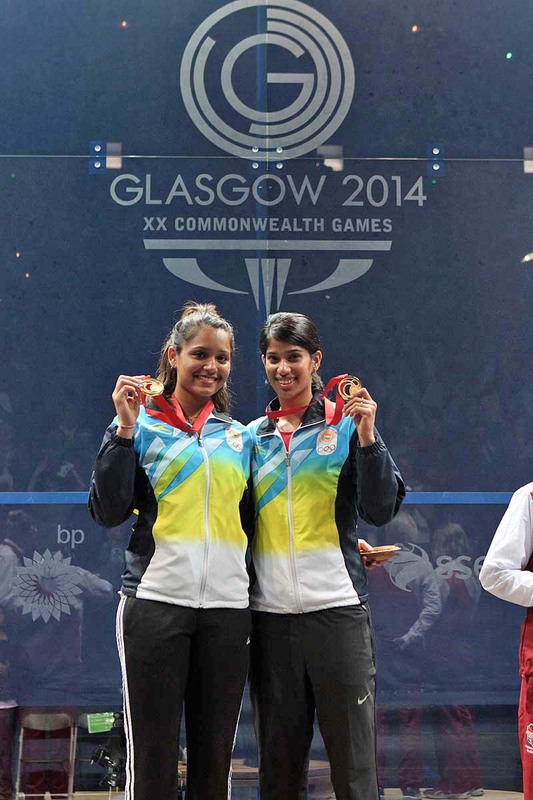 A second upset in 24 hours saw fifth seeds Joshana Chinappa & Dipika Pallikal overcome English favourites Jenny Duncalf & Laura Massaro in today's Women's Doubles final in Glasgow to ensure that India's first ever Commonwealth Games Squash medal is GOLD. The underdogs led throughout the first game on the all-glass showcourt at the Scotstoun Sports Campus, winning 11-6. 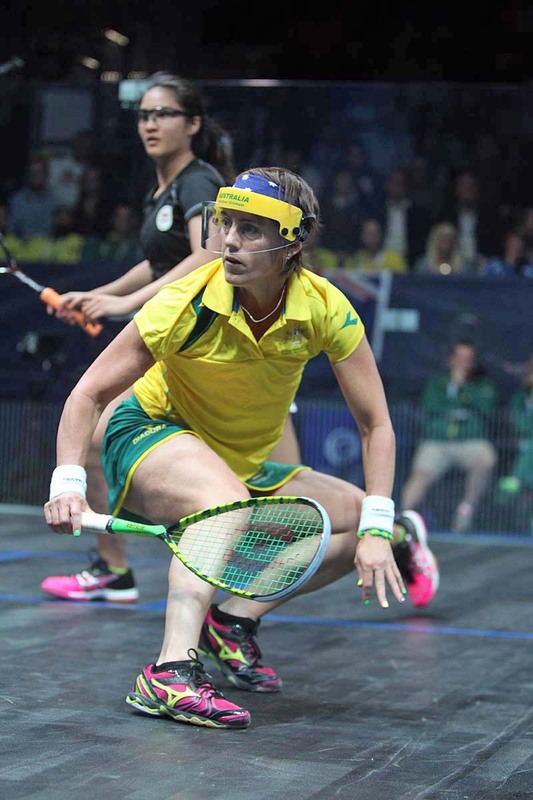 But the top seeds struck back in the second - Massaro, the world No2 and silver medallist in the singles competition, and Duncalf, ranked 13 in the world, soon built up a 7-2 lead. But Chinappa and Pallikal, both based in Chennai, immediately regained the upper-hand - reeling off nine of the next 10 points to claim a sensational 11-6, 11-8 victory after 28 minutes. 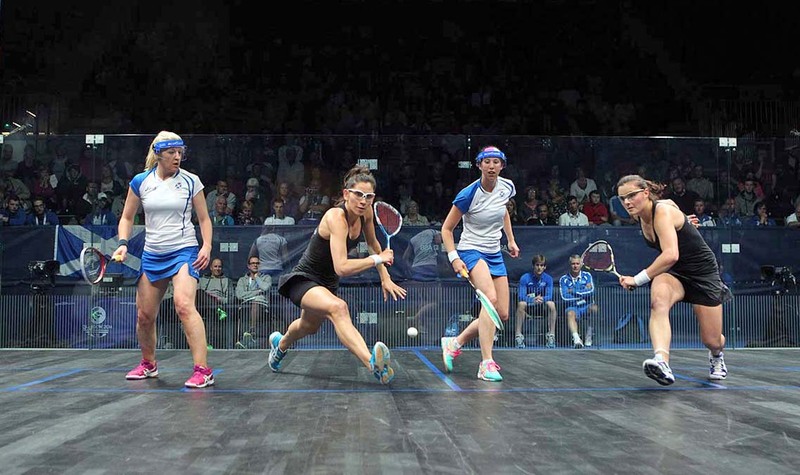 "We just didn't want to let go - if it had gone to one-all, the third would have been very tough," said 22-year-old Pallikal, ranked a career-high 10 in the world. "We have come so far - we didn't want to settle for silver. "This is not just a great win for us, but for Indian Squash." 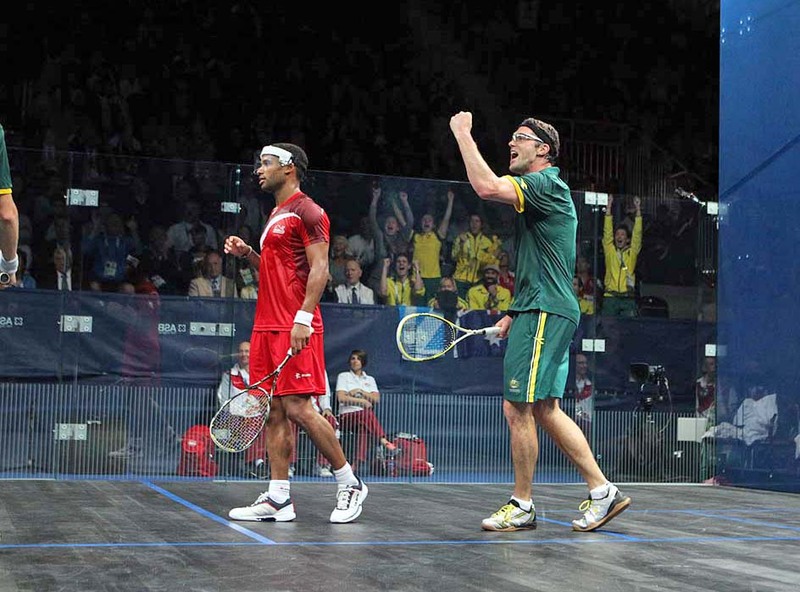 Indian team coach Major Maniam stated that the pair played "awesome squash". 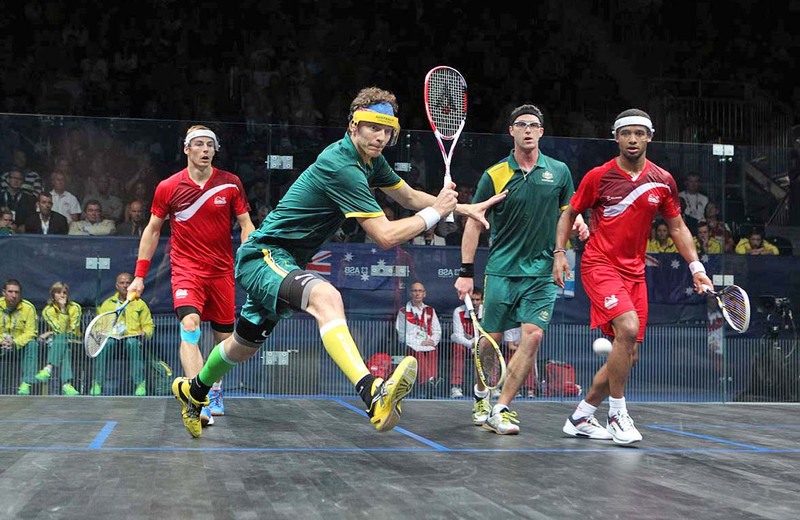 "I think this win will take squash to another level in India - the sport won't just be followed by enthusiasts, but will now grab the attention of the general public." 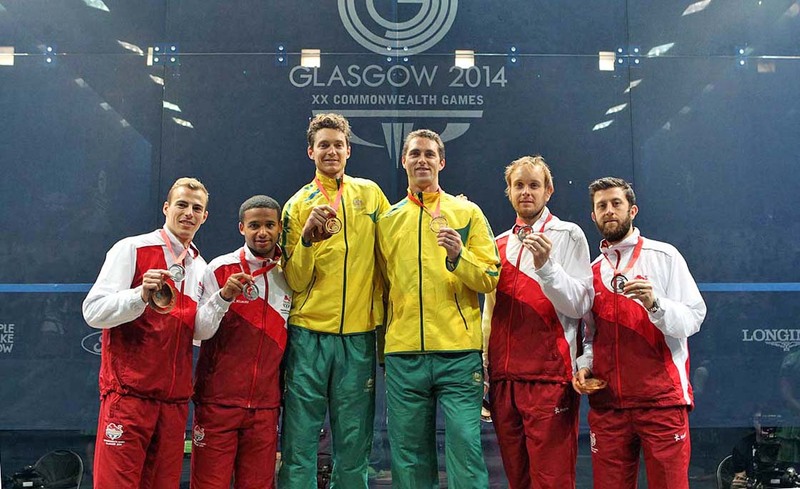 The squash success marks India's 14th gold medal of the Glasgow 2014 Games. "Commonwealth Games gold medals are important in India - and squash is now a gold medal sport," added Maniam. When asked what makes Pallikal and Chinappa such a strong pair, Maniam continued: "They are both equally strong - there isn't a weak link there. We have been targeting the weaker of the two players in our matches, but our two are equally balanced. "Both have their strengths - Dipika has a fantastic deceptive trickle boast. 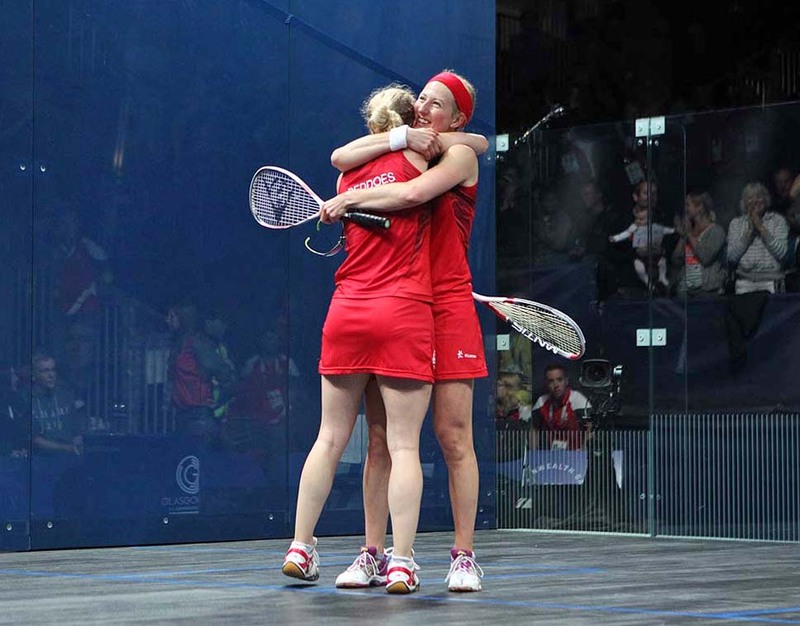 "They played awesome squash today - the whole country will be really proud of them. "I have been to a number of Commonwealth Games - but this is my first medal." 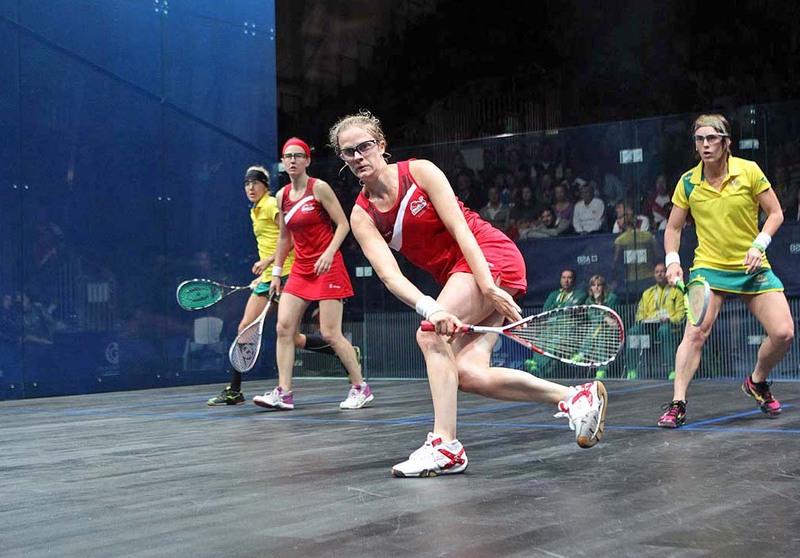 England took bronze when third seeds Emma Beddoes & Alison Waters upset Australians Kasey Brown & Rachael Grinham, the No2 seeds, 11-3, 11-5. "We probably didn't play the way we can play in yesterday's semis - so to come back today and play the best we've ever played together is a real testament to us as a partnership," said Beddoes after winning the first Games medal of her career. "It's the pinnacle of my career. To come away with a medal means everything to me." Waters also enjoyed one of the biggest days of her life, the bronze medal coming just a couple of hours after she and fellow Londoner Peter Barker clinched a place in the Mixed Doubles final for the first time after despatching No2 seeds Joelle King & Martin Knight, of New Zealand, 11-3, 11-6. "Doubles is a very tactical game," said Barker after the mixed win which guarantees the pair at least silver - the best achievements for both of them. "Joelle is probably the best striker of the ball in the women's game. "I'm delighted for myself, but more importantly for Al - especially after her injury last time and her disappointment in the singles here. "I'm very proud of my two bronzes - but this one is for her. "Winning in doubles is a completely different feeling - in singles it's more relief than joy. I've known Al since she was a little girl and we've shared the same coach for many years. I'm absolutely delighted to be able to help her achieve it here." But arguably the biggest hero of the day was David Palmer, the former world number one from Australia who was lured out of retirement to compete in the Games for a record-equalling fifth time. 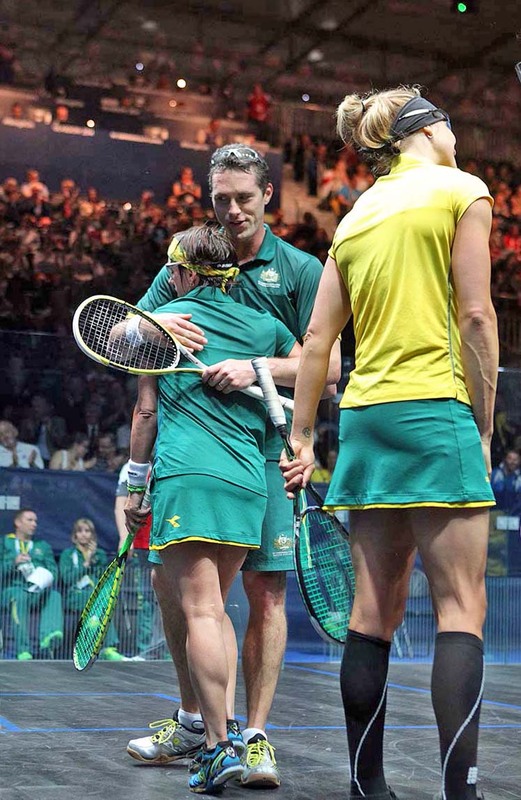 The 38-year-old from New South Wales partnered Rachael Grinham through to victory in the Mixed Doubles semi-finals, and a few hours later secured a place in the Men's Doubles final. 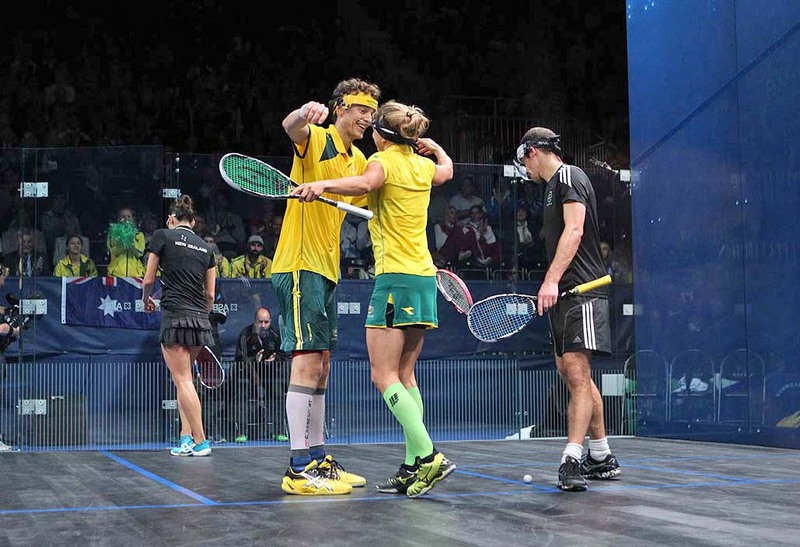 Palmer and Grinham claimed their places in the squash history books after upsetting fellow Aussies Kasey Brown & Cameron Pilley, the top seeds and defending champions, 11-7, 11-4 - a win which guarantees both of them a record seventh Commonwealth Games medal. "Wow! Is that right - nobody else has more than six?" said Grinham on hearing the news. "I'm trying not to think about medals," said Palmer. "It would have been nice if that could have been the final. "I thought we performed well," continued the illustrious Aussie, winner of four British Open and two World Championship titles. "Rachael dominated the forehand side, though Kasey returned so many balls. We were trying to keep it away from Cam - his power is unreal." Pilley's "unreal power" worked a treat for Palmer later when the pair combined to see off England's third seeds Daryl Selby & James Willstrop 11-4, 11-4 in the men's semis. The men's triumph extends Palmer's collection of Games medals to a new record EIGHT - but his single-minded aim is gold, which would be a first. "It's been a perfect day," conceded Palmer. "I just wanted to win both matches - but to do so 2/0 in both cases, in reasonably short time, is a perfect set up. "It was critical we didn't get drawn into long matches." Pilley's place in the men's final compensated for his loss in the mixed semi. 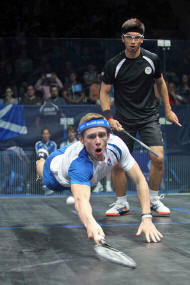 "I was disappointed with today's earlier result, but very happy to make the men's final," said Pilley, the world No20. On his partner Palmer, Pilley added: "He's pretty exceptional. He's made so many major finals and won so many major titles. He brings a steadiness to us." Second seeds Palmer and Pilley will face favourites Adrian Grant & Nick Matthew in Sunday's final after the English pair, winners of gold in Delhi, subdued the packed and partisan Scottish crowd by beating Scots Alan Clyne & Harry Leitch 11-7, 11-2. "We've been under the radar here but we're quietly confident," said Londoner Grant. "There's been a lot of talk about the other pairings but we've just been getting on with our own job. "This is the pinnacle for us," added the left-hander when asked if it was an advantage just playing the one event. "I had to think about what I really want to get out of this - I decided I would rather put all my eggs in one basket and try to get gold in this." Matthew and Grant also beat the Scots, widely considered a 'specialist doubles pairing', at the same stage in Delhi. "A lot of people talk about 'doubles specialists', but I think today we showed that you can play good squash and win," said the world No2 from Sheffield. Matthew is bidding to equal compatriot Peter Nicol's four Commonwealth Games gold medal record - also two in the singles and two in the men's doubles. 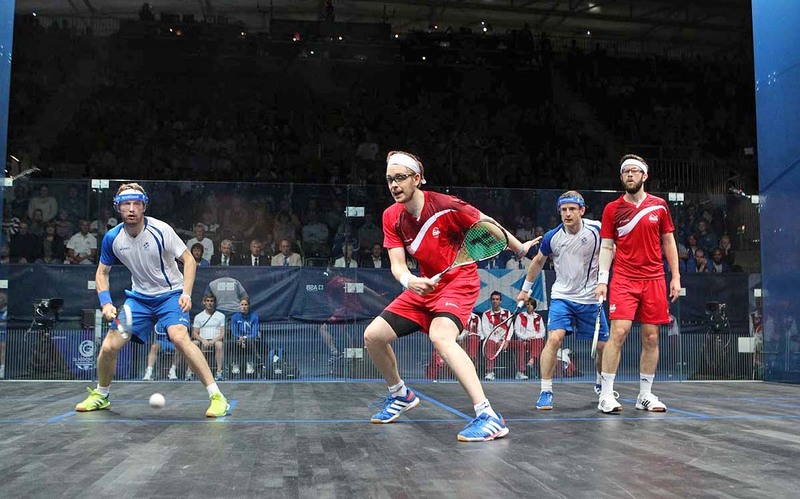 Furthermore, he and Grant will be keen to extend England's grip on the men's doubles title since 1998, the year that squash made its debut in the Games. 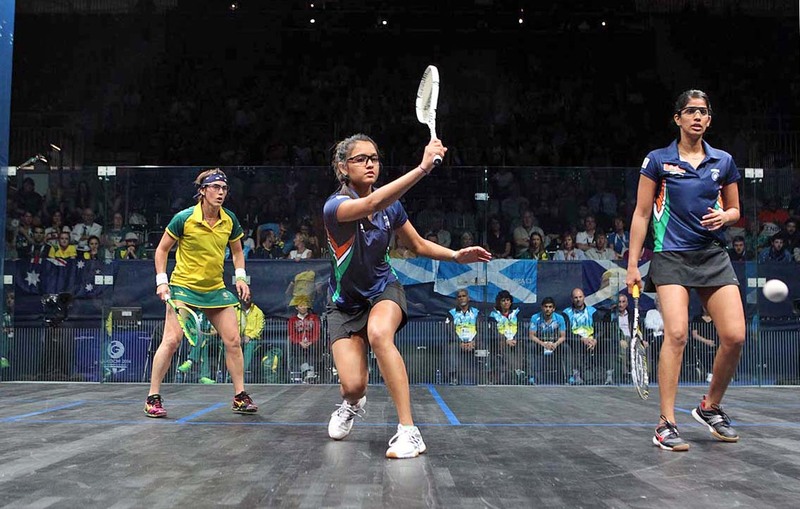 A dramatic upset by Joshana Chinappa & Dipika Pallikal over second-seeded Australian pair Kasey Brown & Rachael Grinham in Friday's Women's Doubles semi-finals at Glasgow 2014 has guaranteed India its first ever Commonwealth Games Squash medal. The fifth-seeded Indians recovered from a second game fight-back on the all-glass showcourt at the Scotstoun Sports Campus in Glasgow to win 11-9, 7-11, 11-4 in 50 minutes. "It's historic that we've won a medal but we won't be satisfied until we get the gold medal," said Pallikal, the 22-year-old from Chennai who was taken ill on the eve of the 2010 Games in Delhi and unable to make her eagerly-anticipated Commonwealth debut on home soil. 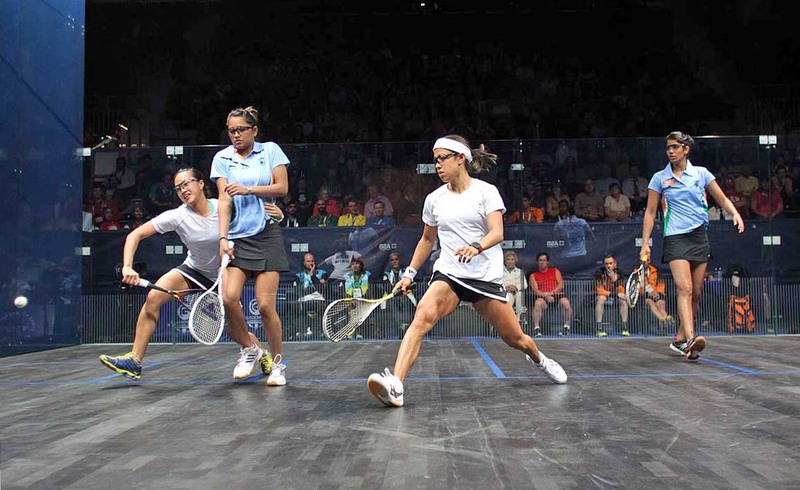 Underdogs Chinappa and Pallikal will face top-seeded English pair Jenny Duncalf & Laura Massaro in Saturday's final. "Every match is difficult but we have come this far and don't want to give up," continued Pallikal, ranked 10 in the world. "The English girls are number one but anything can happen in doubles." Chinappa explained the bond between the two: "Last Commonwealth Games, Dipika was sick and we had a really good chance. This time we were confident nothing would happen - we were fit and well and both of us were doing our respective training. "We knew we would cause some upsets and it is fantastic for our Squash to finally get that first medal," added the 27-year-old world No21. "Hopefully the government will help us more and promote the game more. "The gold medal in any discipline is a fantastic achievement. This is our Olympics." Duncalf and Massaro overcame compatriots Emma Beddoes & Alison Waters 11-7, 11-8 to earn their place in the final. On what he described as a "critical day", Australia's David Palmer survived two tough battles to keep alive his hopes of a first ever Games gold medal - and of extending his shared six-medal record since his debut in 1998. 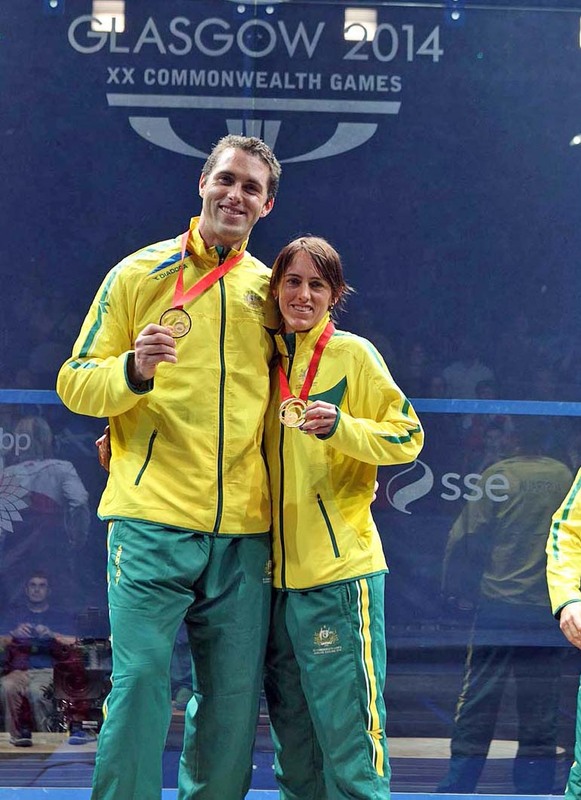 The 38-year-old from New South Wales, nicknamed 'The Marine', first partnered Rachael Grinham to an 11-6, 11-9 Mixed Doubles win over Indians Dipika Pallikal & Saurav Ghosal - then, less than an hour later, returned to the spectacular showcourt with fellow New South Welshman Cameron Pilley to beat local heroes Stuart Crawford & Greg Lobban 11-9, 11-5 in the Men's Doubles quarter-finals. 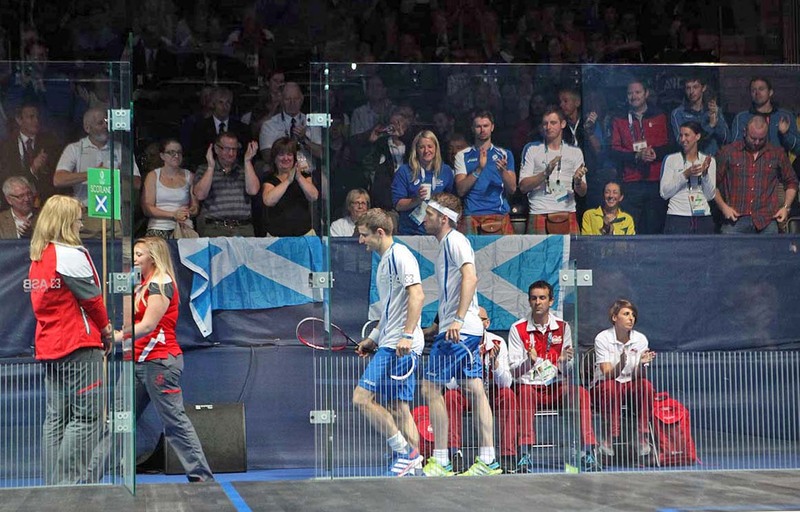 The atmosphere in the packed arena was something to behold - a sell-out crowd (in excess of 2,000) of partisan Scots cheering and stamping their feet in support of underdogs Crawford & Lobban, the 8th seeds who upset the seventh seeds to secure their place in the quarters. 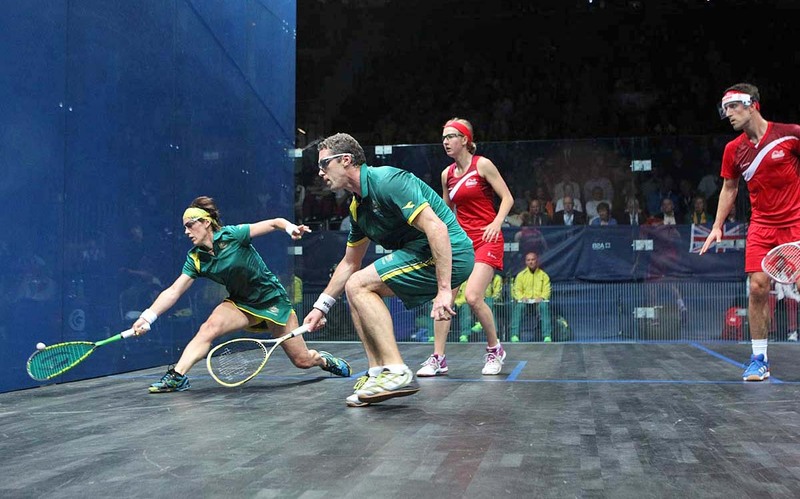 It was neck and neck throughout the first game before the second seeded Aussies pulled away from 9-all. After the earlier mixed quarter-final victory, Palmer said: "We're just happy to get through - we knew it was going to be tough, it was one of the hardest quarter-finals. "Dipika's very strong on the forehand and Saurav's one of the best movers in the game. This is a critical day. "Rachael has great touch down the middle of the court - her deception down the middle really worked." Grinham added: "Every time we get on this court it's a great day. Each time I come into this arena, I get goose-bumps - it's the best atmosphere I've ever played in. "Doubles? I'm really loving it!" 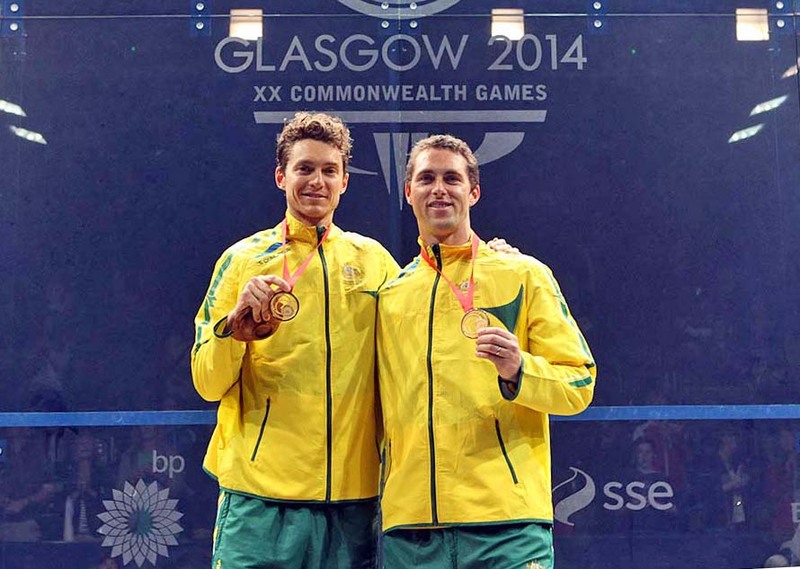 Palmer's men's doubles partner Cameron Pilley is also still in line for double gold. He and Kasey Brown, winners of the mixed gold medal in Delhi, eased in to the semis following an 11-1, 11-8 win over New Zealanders Amanda Landers-Murphy & Paul Coll. Brown, who was celebrating her 29th birthday, said: "It's not a bad way to start your birthday. It's great in front of all this crowd - I'm pretty happy at the moment." Pilley added: "We both gelled together really well then, especially in the first game. We just blew them away in the first and they warmed up in the second. But we managed to reel off about six points on the trot." England retain medal hopes in all three events. 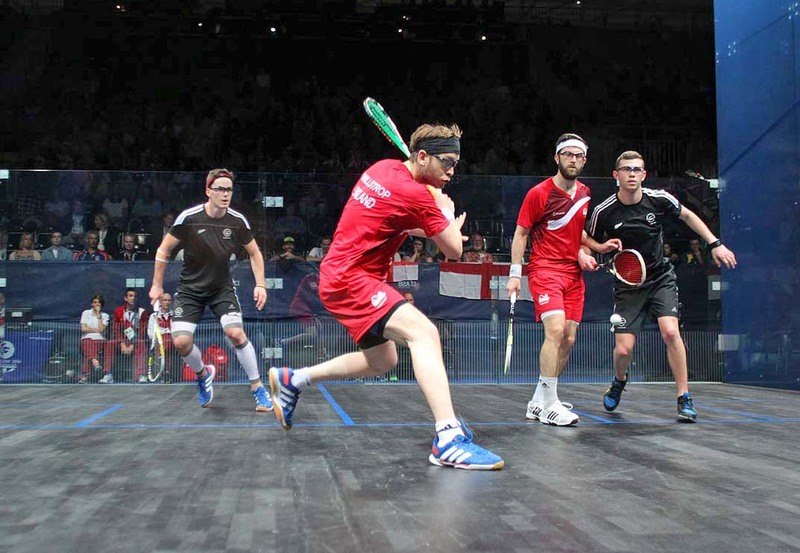 Top seeds and defending champions Adrian Grant & Nick Matthew took their anticipated place in the men's semi-finals after beating Welshmen Peter Creed & David Evans 11-9, 11-4. Team-mates Daryl Selby & James Willstrop prevailed in the other half of the draw - taken the full distance by Kiwi underdogs Lance Beddoes & Paul Coll before winning 11-8, 6-11, 11-9. 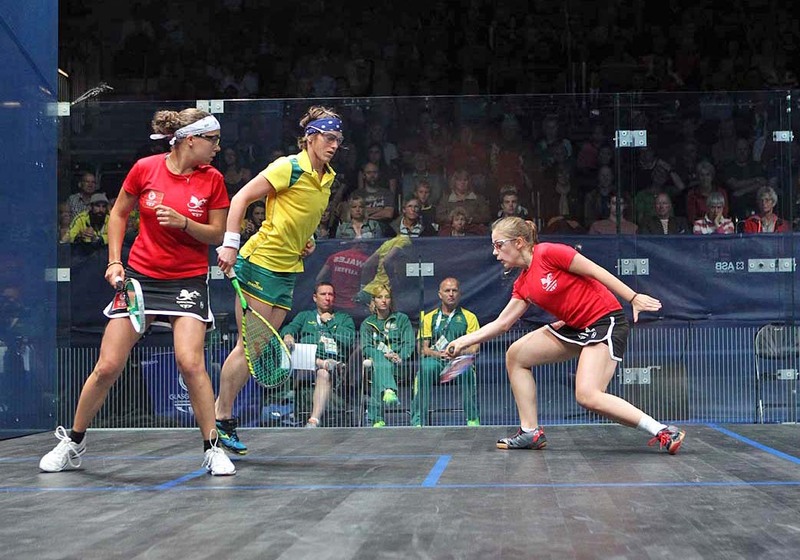 "It was a war in all respects really, it's just really intense and we had to hang in there and be tough, try and play our best squash and keep it together in a lot of momentum shifts," explained singles silver medallist Willstrop. "They could have beaten us today and that is going to be able to happen every game, we know that. "I can't really explain doubles, it's like a leveller with different angles. There is a whole different environment - but in badminton and tennis they have doubles specialists so it feels like a whole different sport to us." Willstrop's partner Selby admitted: "James is a very good and calming influence on me - I wish I could have him with me in the singles. It works well for us. "They are both very good doubles players - they moved us out of position a lot. Paul Coll is an excellent athlete. "I'm really enjoying playing doubles - it's great to be able to fight for a medal." Beddoes said: "That's about as close a doubles game as you can get. Doubles is just a different game but some of the top players don't like it. "I'll be back next time absolutely. I'm only 21 and Paul is only 22." 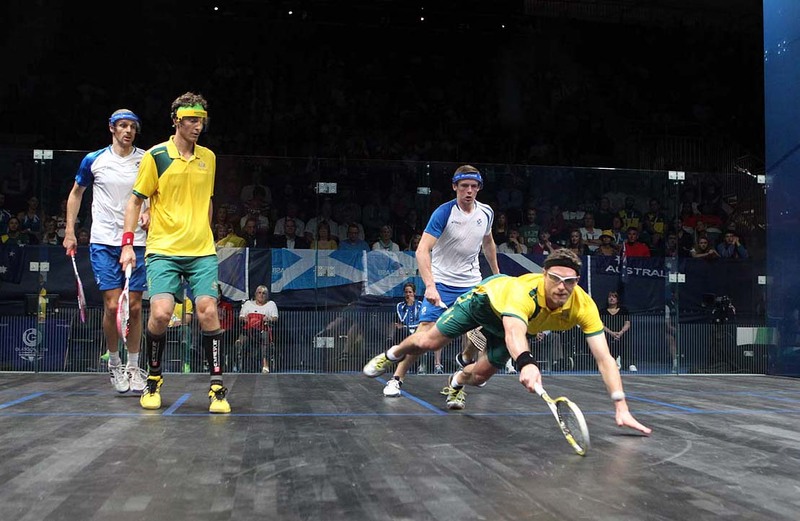 The day's play ended on a high when Scotland's Alan Clyne & Harry Leitch ousted Australians Ryan Cuskelly & Matthew Karwalski 11-7, 11-5, with tumultuous support from the exuberant crowd. 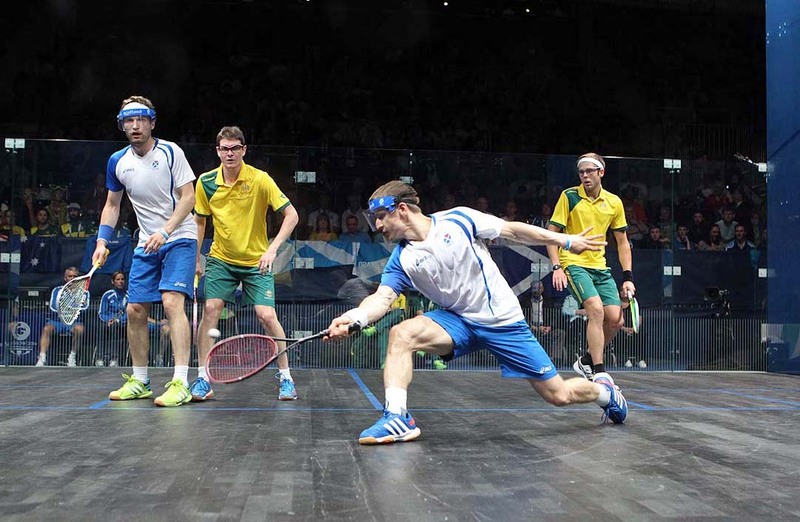 The action on the fourth day of 2014 Commonwealth Games Squash Doubles was perfectly - and succinctly - summed by event MC Alan Thatcher: "Drama, excitement, passion, skill noisy crowds all add up to a brilliant showcase for doubles squash!" 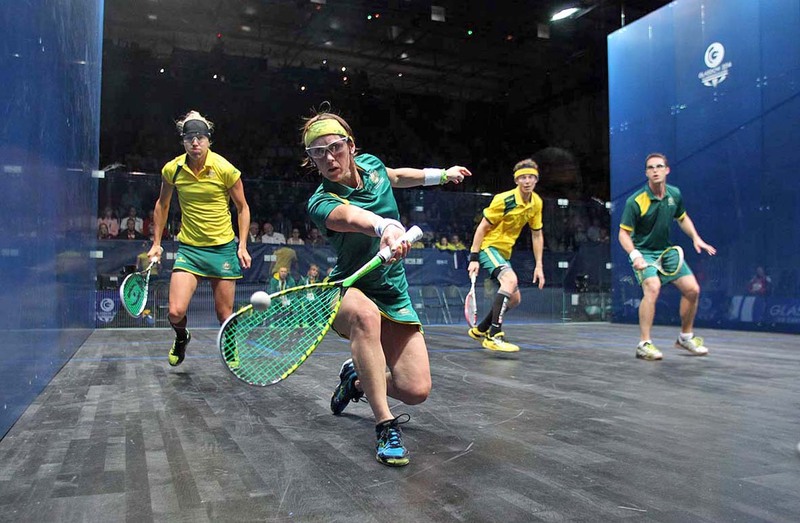 Only England and Australia have medal hopes in all three Doubles events after Thursday's action-packed Commonwealth Games Squash schedule at the Scotstoun Sports Campus in Glasgow. 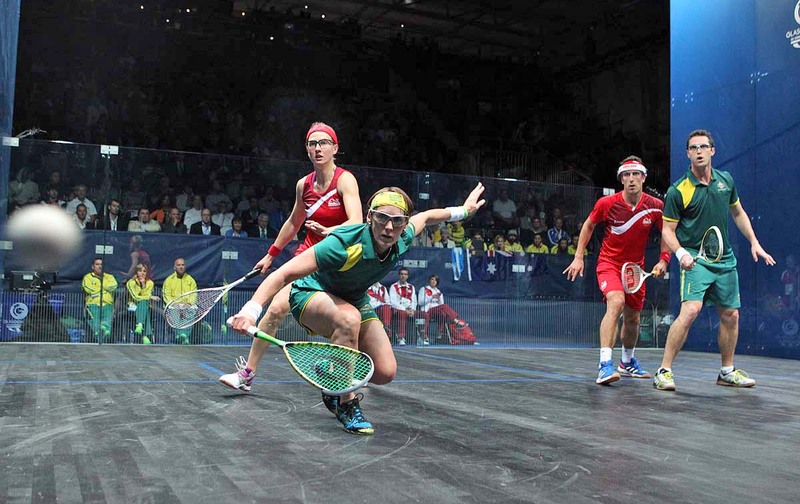 Men's singles gold medallist Nick Matthew leads the England attack, while key to the Australian campaign are former world number ones David Palmer and Rachael Grinham, both of whom are poised to extend their record haul of six medals apiece since the sport's Games debut in Kuala Lumpur in 1998. 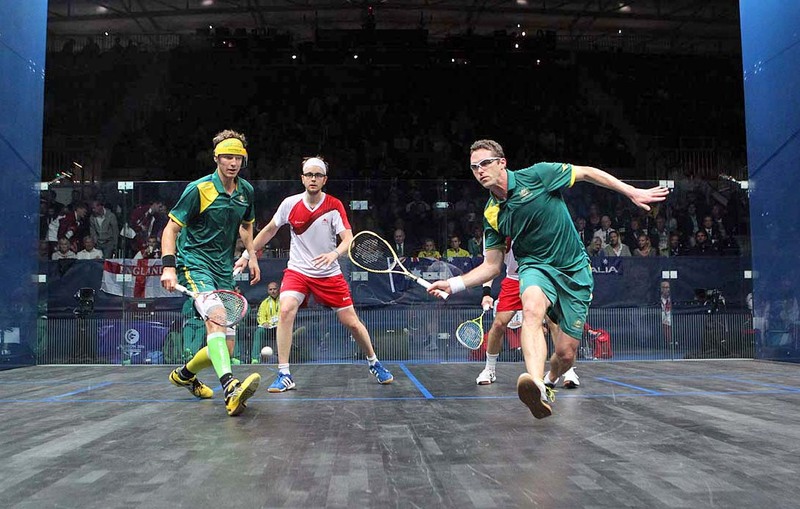 Matthew and Adrian Grant, winners of the Men's Doubles gold medal in 2010 in Delhi, beat Jamaicans Christopher Binnie & Bruce Burrowes 11-6, 11-5 to set up a quarter-final clash with Welshmen Peter Creed & David Evans. Together, Palmer and Grinham eased into the Mixed Doubles last eight after beating Tesni Evans and Creed 11-5, 11-4, while Grinham partnered Kasey Brown into the Women's Doubles semi-finals and Palmer and Cameron Pilley made it through to the men's quarters. 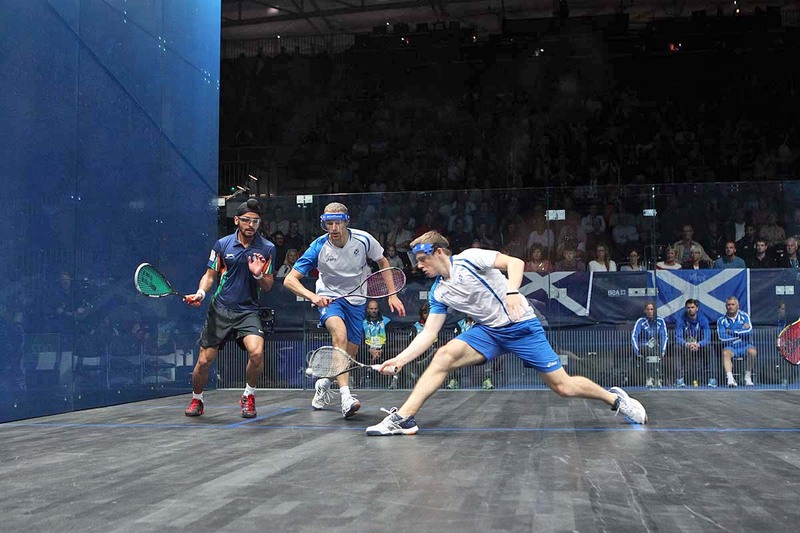 The day began well for the hosts in the men's doubles where Scotland's second pairing Stuart Crawford & Greg Lobban thrilled the partisan crowd by upsetting India's No7 seeds Saurav Ghosal & Harinder Pal Sandhu 11-5, 8-11, 11-9. Inspired by this success shortly afterwards, the country's top duo Alan Clyne & Harry Leitch, the fourth seeds, despatched Zambians Mwinga Lengwe & Kelvin Ndhlovu 11-4, 11-4. Commenting on the earlier upset, Crawford said: "We knew it was going to be a tough match, but we've been playing well so we were quietly confident. We've done a lot of doubles training in the last year and a half so we definitely felt we had a good chance of beating them." 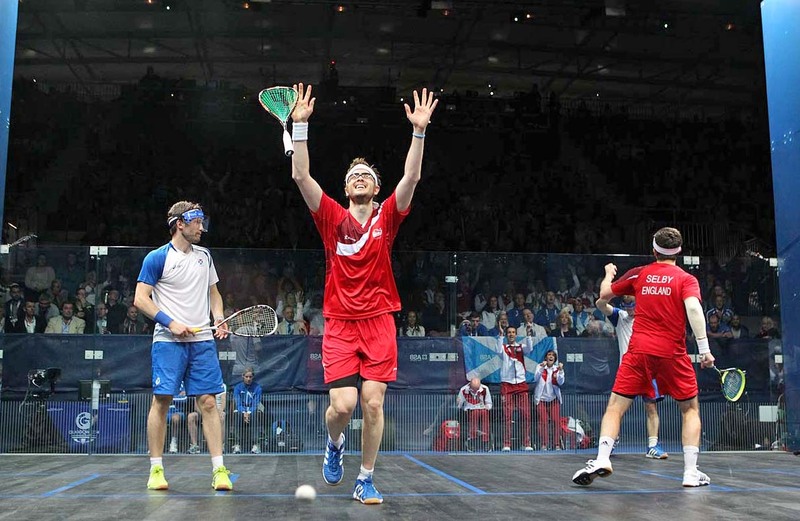 Lobban, 21, delivered the match-winning shot - a backhand slam into the front right nick. "Greg's a very naturally-talented and gifted player which I think the last shot of the match proved," continued Crawford, Scotland's 33-year-old assistant national coach. "I think we've got a really good balance of youth and experience and his explosiveness and my steady calming influence works really well. He can sometimes get a bit fiery. "He's an awesome talent and I can't wait to watch him progress over the rest of this tournament and over the singles tour over the next ten years." Ghosal, the world No16 who reached the singles semi-finals, said: " It's very hard - we lost and we are out now. They came out better in the first game and in the second we were better than them - and in the third it was neck and neck." When asked to comment on squad member Mahesh Mangaonkar's statement on Twitter the previous day that 'if India doesn't win a medal in the squash doubles then I will do 10 court sprints with just my underwear on the show court', Ghosal said: "That was one of the funniest tweets I've ever seen. "Hopefully we'll spare him the embarrassment!" Clyne admitted that his fellow countrymen's win gave him and Leitch a lift: "They really got pumped up and got a good win - that spurred us on." The seasoned pair reached the 2010 semi-finals in Delhi, since when part-timer Leitch has graduated in medicine and now also has a PhD - and starts work as a junior doctor two days after the Games finish. "He's really good at cross court nicks and straight nicks," said world No35 Clyne of his partner. "He's really good attacking-wise but he's also really strong in the head - I know he's never going to let us down. We work really well together as a team. I probably use my pace more and he's got the power." 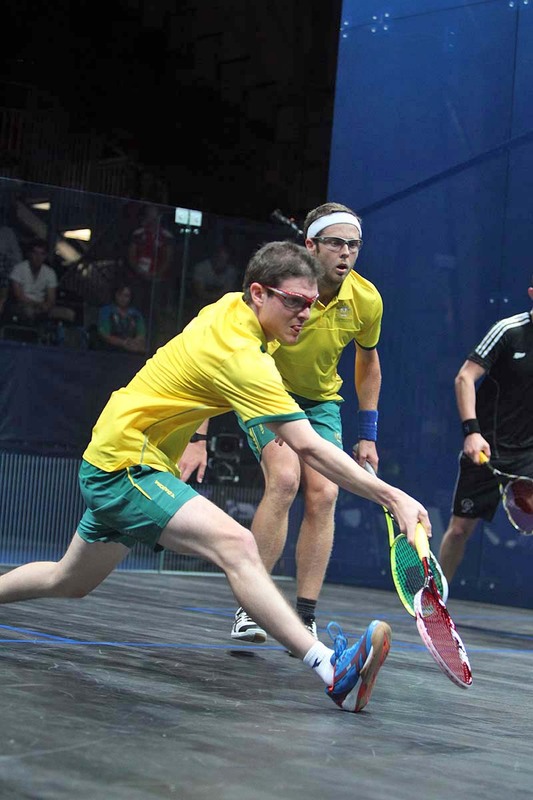 A later men's doubles upset saw the balance of power in New Zealand men's squash disturbed when underdogs Lance Beddoes & Paul Coll beat fellow Kiwis Campbell Grayson & Martin Knight, the fifth seeds, 11-7, 12-10. "You have to put aside that they're your mates and get on with the match. It was a pretty clean match today," said a delighted Beddoes afterwards. "It's definitely a different game - if you look at the rankings, they are 42 and 46, whereas I think we are 136 and 72! It's definitely a leveller." 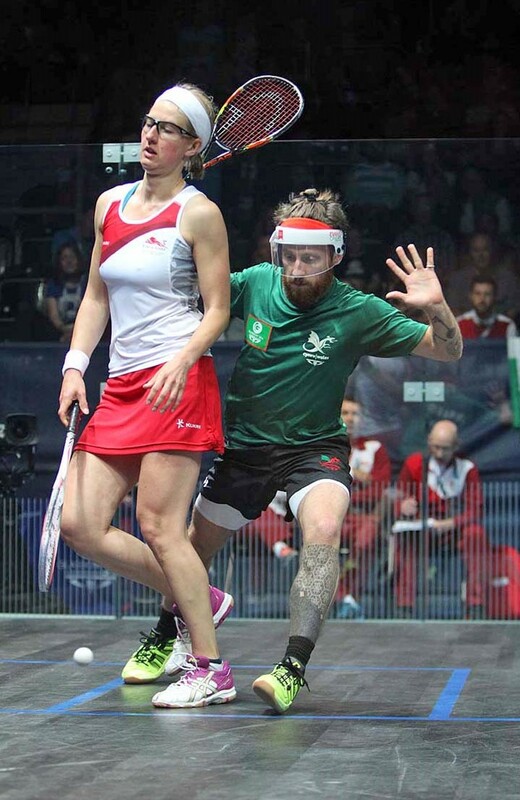 Knight went on to partner Joelle King to victory in the last 16 round of the Mixed Doubles, the second-seeded pairing beating Malaysia's Rachael Arnold & Valentino Bon Jovi Bong 11-1, 11-6 to secure a place in the quarter-finals. "It was probably the toughest draw we could have had - they were grossly under-seeded," said Knight of his earlier domestic battle. "We were under no illusions about the task we had - we only just beat them in a recent Tri-Nations final, in a tough 2/1." On the new-format doubles, the world No44 from Wellington added: "I like the lower tin - it encourages attacking squash. It's pretty unforgiving. I would actually like to see it go back to best-of-five. You can get some exceptionally quick matches. "The stadium here is awesome. The crowds have been really good all week for both the singles and doubles - it's a great atmosphere." King's mixed victory with Knight immediately followed her shock defeat with Amanda Landers-Murphy in the Women's Doubles. Defending her Delhi gold medal, King went down 11-9, 11-5 to fifth-seeded Indians Joshana Chinappa & Dipika Pallikal. "When you're in these events, you have matches back-to-back and you have to deal with it," said the world No4, the bronze medallist in the singles. "I think we're both quite good at putting what's happened behind us and just moving on." 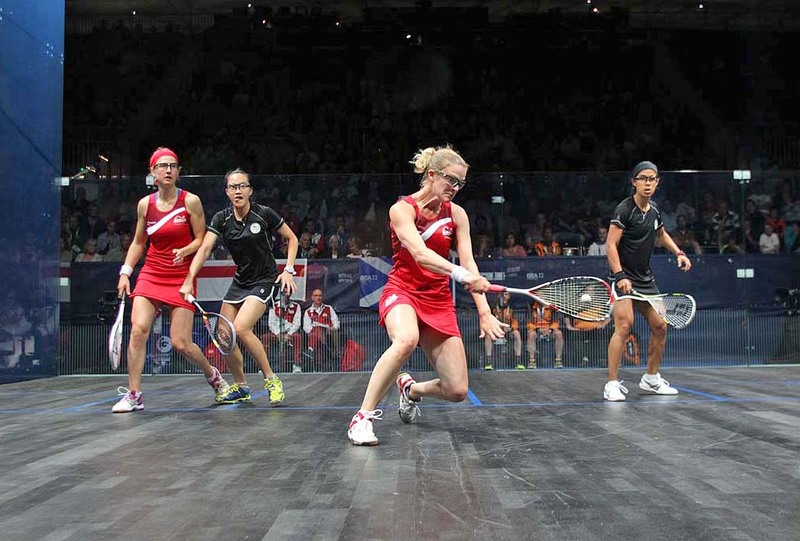 But it is only England who already have a certain doubles medal to their credit after Jenny Duncalf & Laura Massaro and Emma Beddoes & Alison Waters set up an all-English women's doubles semi-final. 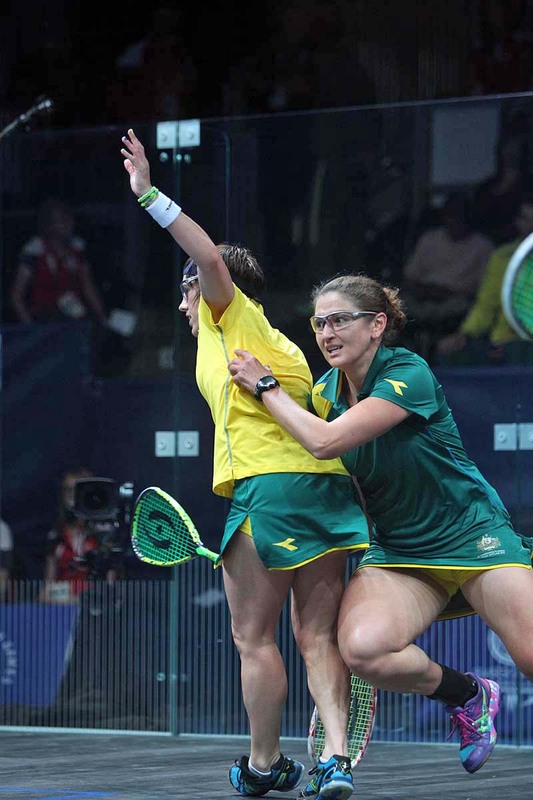 Top seeds Duncalf & Massaro beat Australian pair Lisa Camilleri & Donna Urquhart 11-7, 11-4, while third seeds Beddoes & Waters defeated Malaysians Nicol David & Low Wee Wern 11-10, 11-8 - thus bringing two-time women's singles gold medallist David's Glasgow 2014 run to an end. "That's probably the best we've played since Delhi," said Massaro afterwards. "We've always said when the medals get on it, we'd bring our best game out and that was good." Commenting on the all-English semi, Games debutante Beddoes said: "We obviously know their game well and they know our game well. Hopefully it will be a great game and we hope to come out on the right side of it." 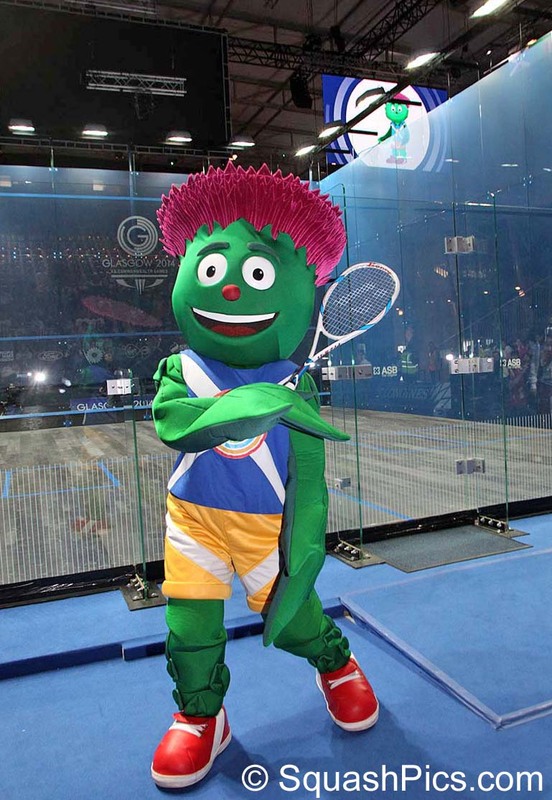 Further intense Squash doubles action at the Scotstoun Sports Campus in Glasgow has led to the knockout stages of the men's and women's events in the 2014 Commonwealth Games in Scotland's largest city. Malta duo Bradley Hindle & Daniel Zammit-Lewis became the only unseeded pairing to make the last 16 round of the Men's Doubles after ousting Guyana's 16th seeds Alexander Arjoon & Sunil Seth 11-5, 11-7 on the day that Arjoon was celebrating his 22nd birthday! Hindle & Zammit-Lewis's reward is a clash with David Palmer & Cameron Pilley, the No2 seeds from Australia. Welsh pair Peter Creed & David Evans followed their impressive upset over India's 7th seeds Saurav Ghosal & Harinder Pal Sandhu on Tuesday by beating Cayman Islands pair Malton Blair & Julian Jervis 11-1, 11-5 to top Pool G.
"We knew yesterday's match would be the toughest match of the group - but we work well together and knew we were in with a shout," said five-time and reigning Welsh national champion Creed. "Today's match felt harder mentally - we both felt a bit edgy, we'd both had mixed matches earlier in the day." Evans, a 39-year-old former world No3, has been focussed on coaching since retiring from the professional circuit almost decade ago. "At the start of the year, there was no plan for us to play together - but we played an event and realised we worked well together," said the former British Open champion from Pontypool. "And now it means we've got two strong Welsh men's pairs here. "But the pleasing thing about today is that this is the best we've played. "The new doubles format makes the game a lot more exciting - it's definitely better than it was - it's a lot more open. There are a lot of good pairs here." 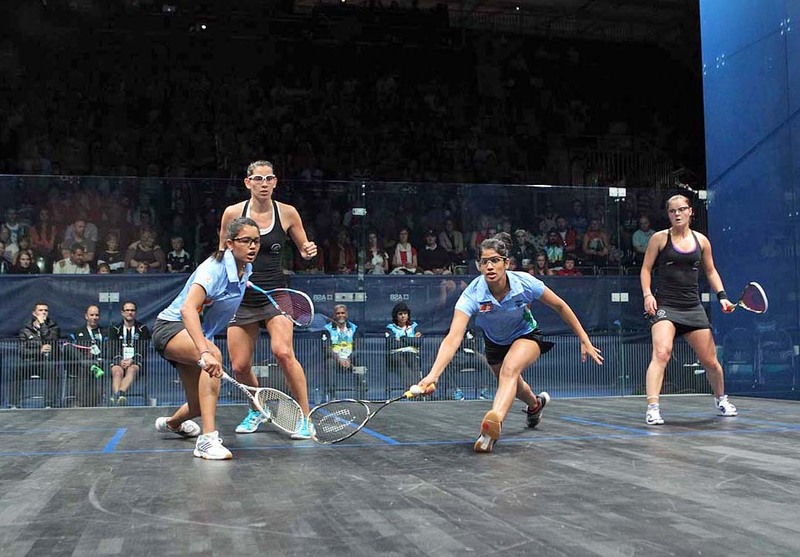 The top eight seeds will contest the Women's Doubles quarter-finals - but Malaysian pairing Nicol David & Low Wee Wern, the fourth seeds, went down 11-8, 11-5 to Joshana Chinappa & Dipika Pallikal in a defeat which ultimately led to the fifth seeds from India topping the Pool. "We did really well in the first game but they started off better in the second," explained David, the singles gold medallist. "With doubles, it can be anyone's game - we have to learn from this. They've had far more practice than we have." 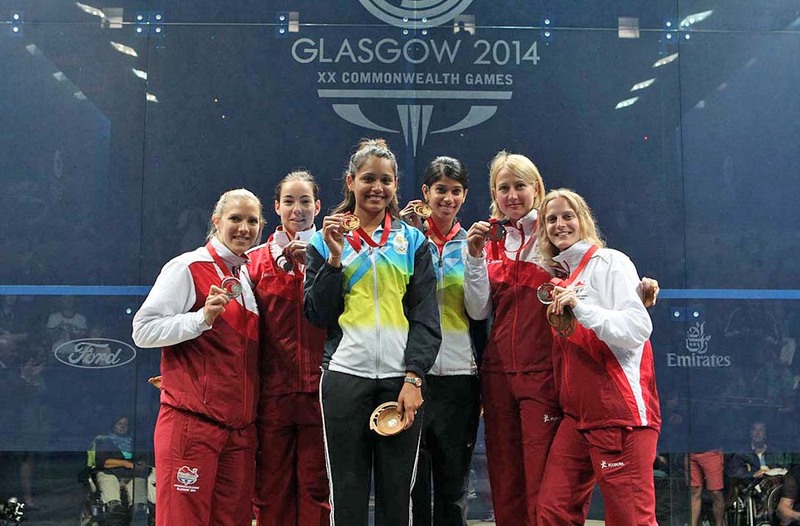 Pallikal, the 22-year-old world No10, confirmed: "We really upped our game in the second. "Joshana and I have had a lot of doubles practice - we have an understanding. We know each other's game and I think that showed. We really enjoy doubles and I think a lot of people don't. "We're really looking to get to the final." The Mixed Doubles event is also heading towards a last 16 knockout round, but a further qualifying matches will take place on Thursday. 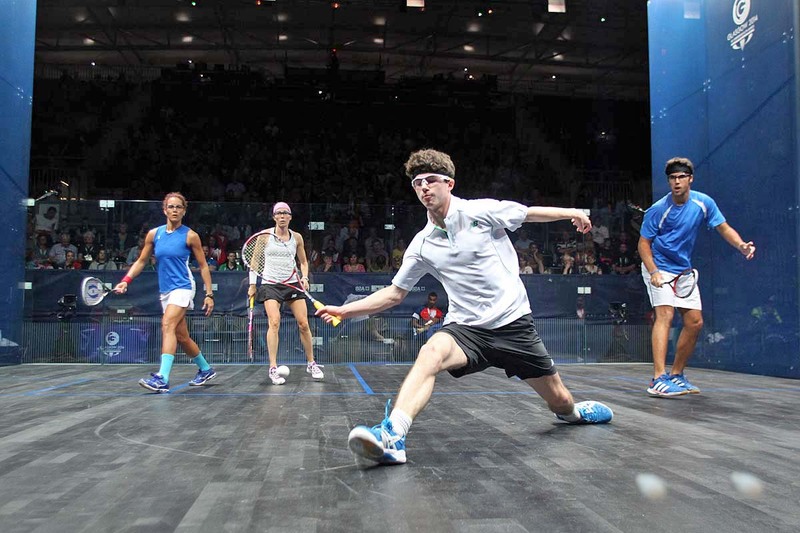 Scottish interest is still riding high in both the men's and mixed events - led by Alan Clyne, the world No35 from Edinburgh. The Scottish number one partnered Frania Gillen-Buchert to a crucial upset over Delia Arnold & Mohd Nafiizwan Adnan, the No8 seeds from Malaysia, 11-8, 11-10. "This is my fourth match in two days - it's quite a schedule," said Clyne. "And that was a big match - they were seeded above us. We've been able to do a lot of practice in the last few days, which has helped. "Frania didn't play in the singles so for her it's doubles, doubles, doubles - which is helping a lot. "The new format has done wonders for doubles - you can get rewarded for using the front of the court." Fresh from his bronze success in the men's singles, England's Peter Barker partnered fellow Londoner Alison Waters to an 11-9, 10-11, 11-5 win over Welsh pair Tesni Evans & Peter Creed. "Alison was able to use some of her drops effectively as she was taking most of the play," explained world No8 Barker. "We took each rally for what it was and both teams played some good stuff and I thought it was an exciting match. "We had played them a couple of times over the summer in training squads but today they swapped sides so we had to change our tactics at the last minute. "That was good for us because usually we are quite particular and regimented in many ways so it was good to come through the match having to change our tactics. "Ali was the only girl I wanted to play with and I think we play really well together. "You only have to look at the length of the matches to see that the new format is working. The games are much more exciting - just look at the crowd reaction. I hope it is a step forward. "It's so different from what we're used to - different movement and different tactics. Even though I was playing with my best mate (Daryl Selby) last time in Delhi, I didn't enjoy it - so I really wanted to enjoy it this time." 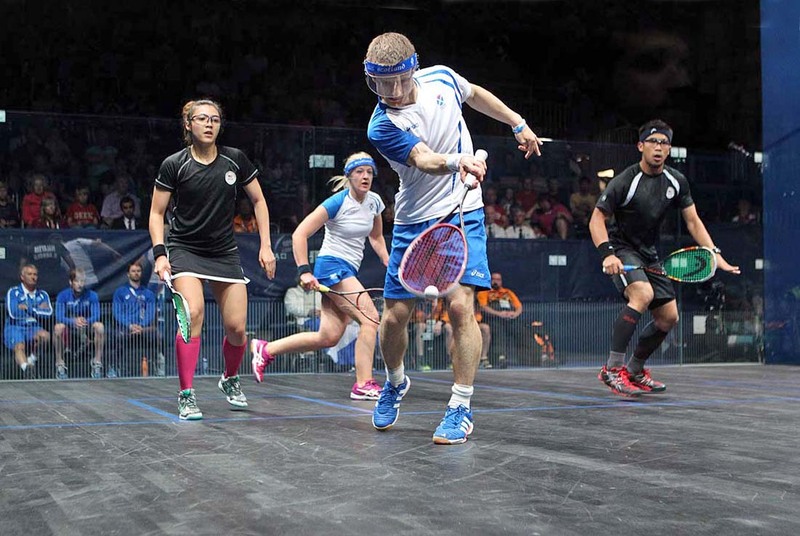 After Monday's exhilarating climax to the Commonwealth Games Squash singles action in Glasgow, players from 25 nations switched to doubles squash at the Scotstoun Sports Campus in Scotland's largest city. 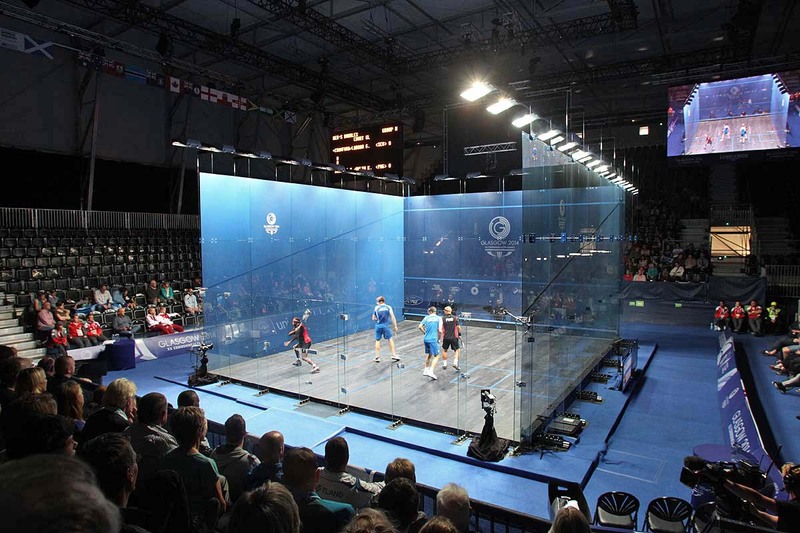 Overnight, the venue's squash courts, including the spectacular all-glass showcourt, were converted to 25 ft wide doubles courts (four feet wider than for singles) - incorporating, for the first time at the Games, a lower, 13-inch, 'tin'. Both singles gold medallists were in action: Men's winner Nick Matthew, the 34-year-old world No2 from England, successfully began the defence of his Men's Doubles gold medal with partner Adrian Grant, comfortably winning both Pool matches. 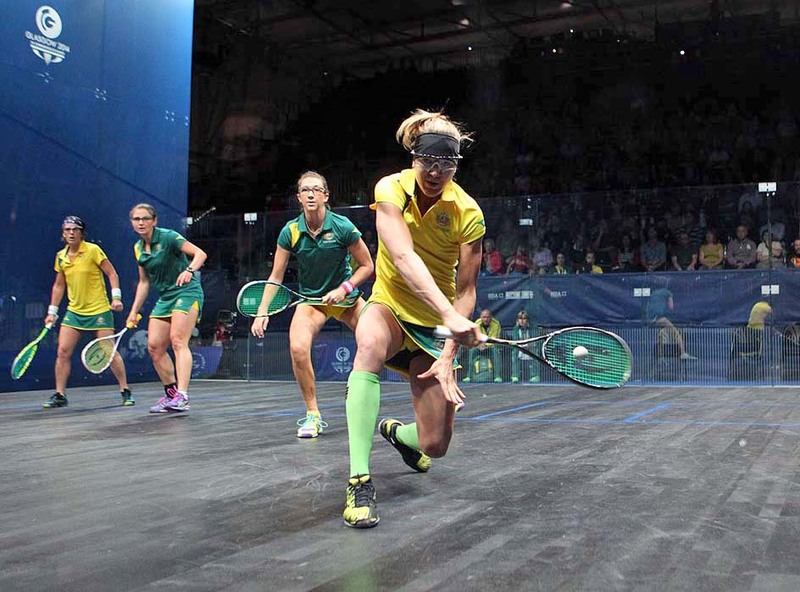 But Nicol David - the Malaysian who, like Matthew, successful retained the singles title she won in 2010 in Delhi - suffered a scare in the Women's Doubles when a game behind and 5-0 down in the second against unseeded underdogs Megan Craig & Kylie Lindsay, of New Zealand. At 10-all - game-ball for the fourth seeds but match-ball for the Kiwis - David's partner Low Wee Wern struck a ball which died in the back wall nick to win the game. The Penang pair went on to clinch the match 7-11, 11-10, 11-6 in 42 minutes. "The shot came at the right time," said Wee Wern. "I've been trying that all match and it worked. "They'd had a bit more practice over the last two days - when Nicol was a bit busy!" When asked to sum up the match, David said: "It was close! We've got a good partnership - and we'd played them before so we knew what they were like. "I had a quiet celebration last night - I had to get ready for this. "Doubles is a bit different from singles - and you could see that in the first game - but it's a nice feeling playing doubles. It's all about putting tactics together." Matthew and Grant's pre-event preparation was also hampered by the Yorkshireman's knee surgery: "We've not had a lot of practice because of my injury - and I need to give a big shout to England team-mate Tom (Richards) who stepped in and really helped Adrian get the competition he needed," said Matthew. "It was really strange watching them practise while I was recovering. "It felt like I had a hangover when I woke up this morning - which I didn't - and I'm now feeding off Adrian's energy. He's so keen. "Anything can happen in doubles, for sure. In Melbourne, we thought our singles strength would carry us through, but it didn't, and we learnt from that." Matthew had earlier described the previous day as 'the best sporting day of my life': "It was pretty emotional, there's not been much time for it to sink it as it was straight back to doubles. "I think I will really digest it next week. I've got to have the mentality that the job is not done, it's only half way done." Grant added: "What Nick achieved was fantastic - both for him and for the sport." 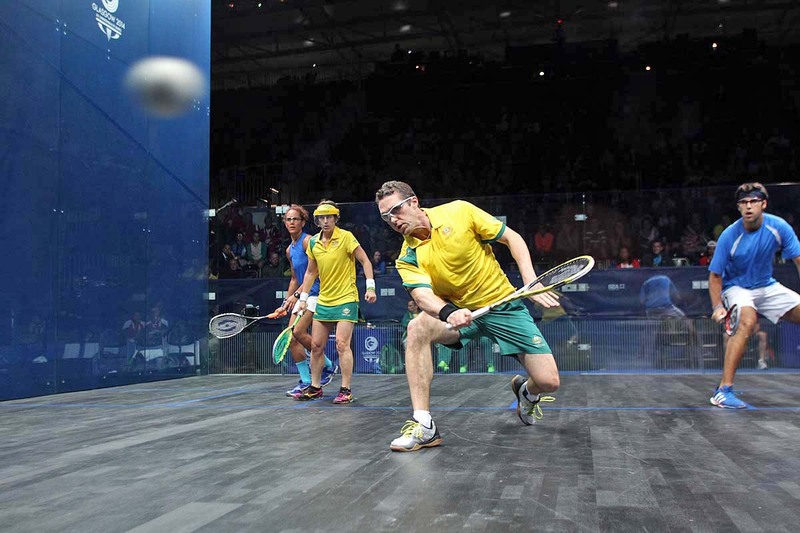 Squash legend David Palmer finally made his Glasgow 2014 debut - lured out of retirement to make a fifth successive appearance in the Games for Australia. 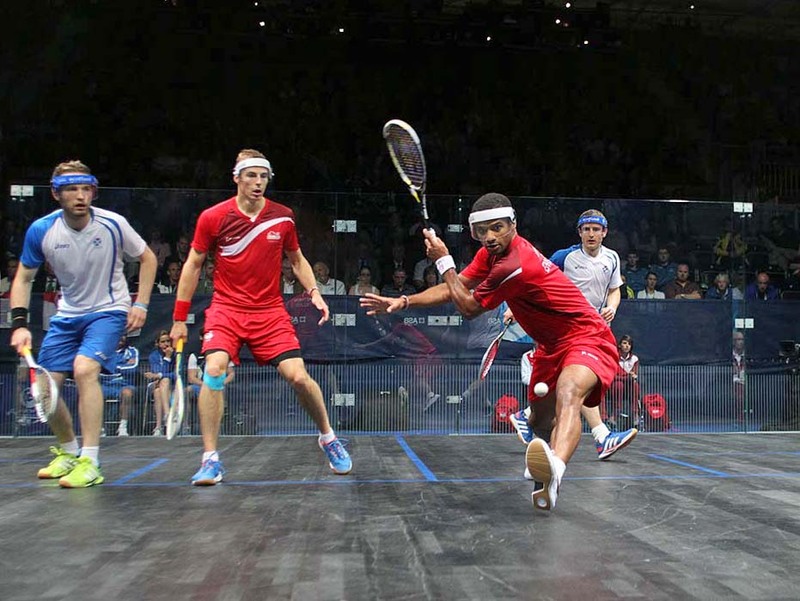 The 38-year-old former world No1 and world champion opened his campaign in the men's doubles, partnering world No20 Cameron Pilley and bidding for a record seventh medal, but a first gold. He and Pilley won both their matches, then with Rachael Grinham in the Mixed Doubles recovered from game down to down 8-11, 11-3, 11-2. "It feels special being here," said Palmer. "After watching all the matches all week, it's great to get onto the court. "I wanted to play with Cameron - I think we match each other well. His style is perfect for us and he's done really well here this week in the singles. "I'm here trying to win medals for Australia - I've got three matches today, but I've prepared for it. I'm missing that gold medal - I came close in Delhi." In commenting on the new doubles format, Pilley added: "I think the new format is good - before, it wasn't exciting but now it's good for the crowd. It's now really exciting and more attacking. I think it's here to stay." 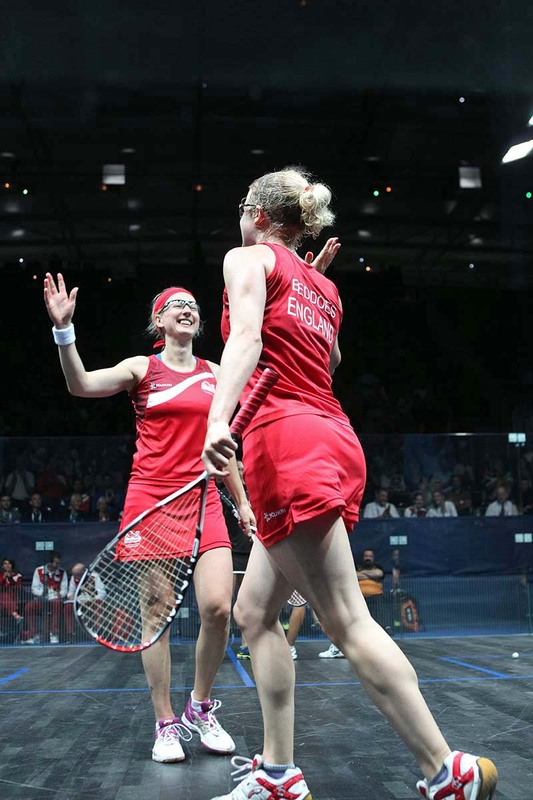 England pair Daryl Selby and Sarah Kippax also made their 2014 Games' debuts after supporting their team-mates through the singles. 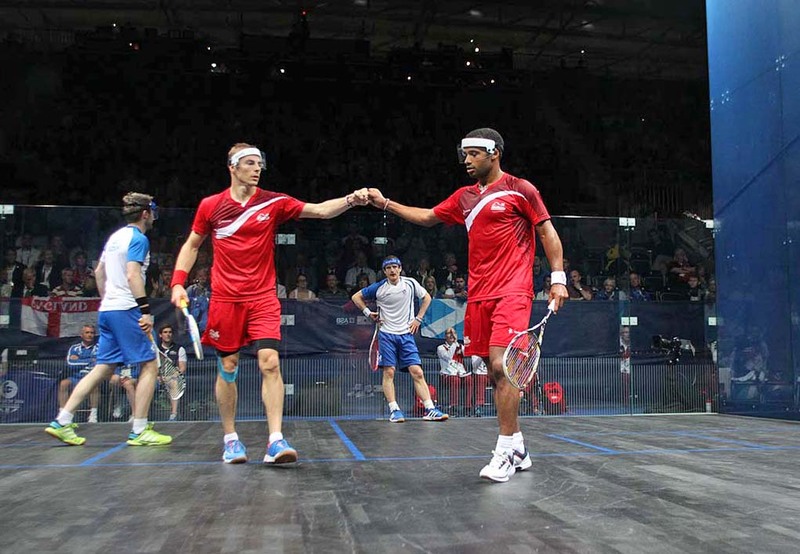 The duo despatched Trinidad & Tobago's Kerrie Sample & Colin Ramasra 11-1, 11-4. "Sarah and I came together quite late as a pair, but we know each other well and have forged a good partnership," said Selby. "We're seeded six, so not expected to medal, so if we do it will be a massive bonus." On comparing the two disciplines, Selby continued: "I've always enjoyed playing doubles but we just don't play it enough for it to be something that I am 100% confident in my ability in. "With singles, I go on court and I know what I've got to do - the tactics are sorted beforehand and it's automatic. It's like driving a car, you don't think about it. 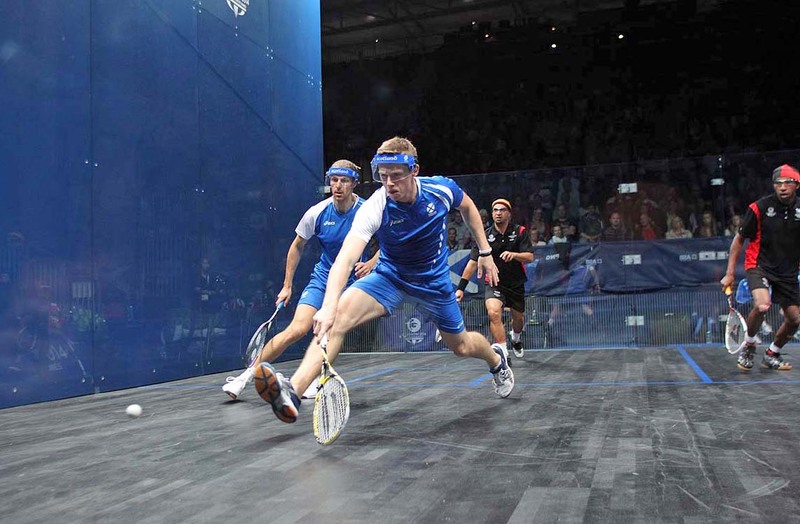 "But in doubles, it's still squash - but it's like driving a lorry instead of a car! You don't do it very often, and you are manoeuvring something that you are not 100% comfortable with." 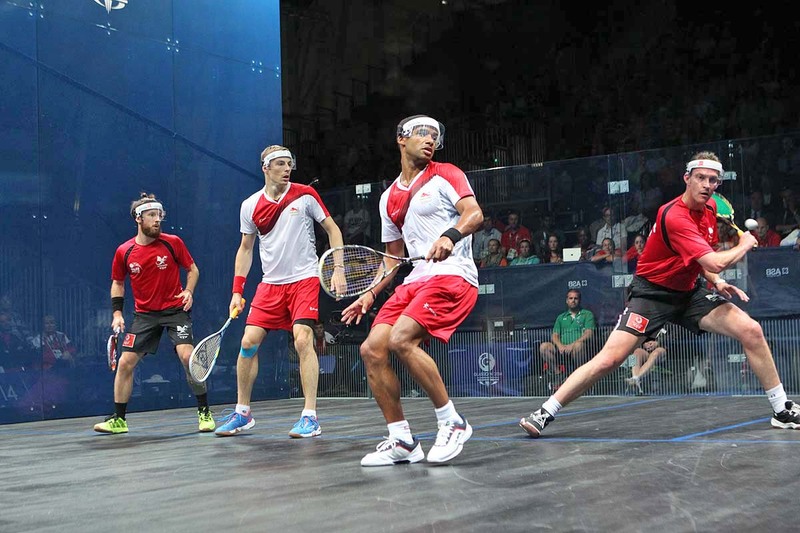 The only significant upset of the day came in the men's doubles where Welshmen Peter Creed & David Evans, the No10 seeds, beat Indian pairing Saurav Ghosal & Harinder Pal Sandhu, seeded seven, 11-8, 11-3. 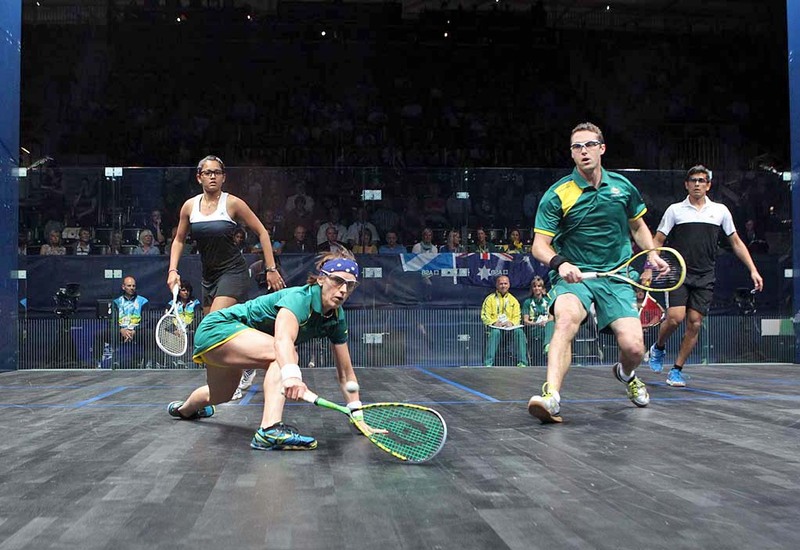 A peak television audience of one million viewers tuned in to BBC1 to watch Nick Matthew and Nicol David claim Gold in the finals of the Commonwealth Games squash competition on Monday July 28. Figures released by the British broadcaster show that 0.8 million viewers tuned in to see David, the Malaysian World No.1, beat England's Laura Massaro in a intriguing 3-0 win while the audience rose to 1 million as Matthew took on perennial rival James Willstrop in the final of the men's singles event. 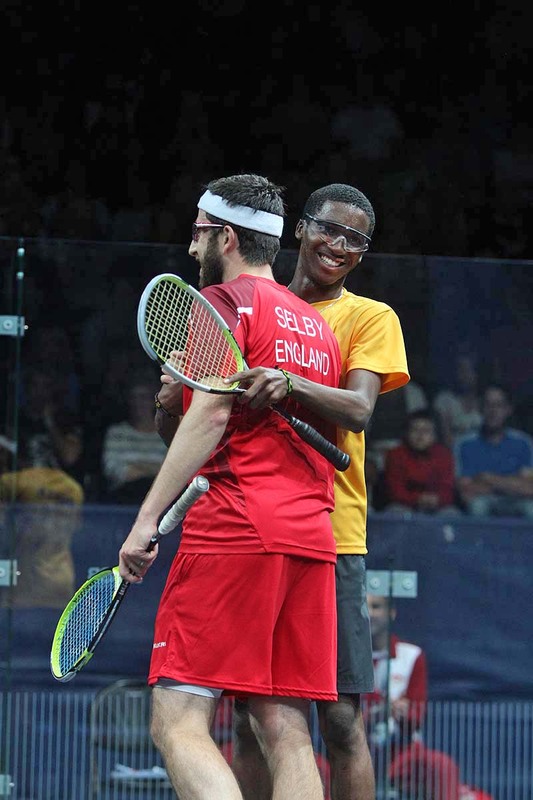 The Yorkshire-duo dazzled the crowds and viewers alike as they battled for 100-minutes in a thrilling 11-9, 8-11, 11-5, 6-11, 11-5 encounter which saw Matthew claim his second successive singles Gold medal. 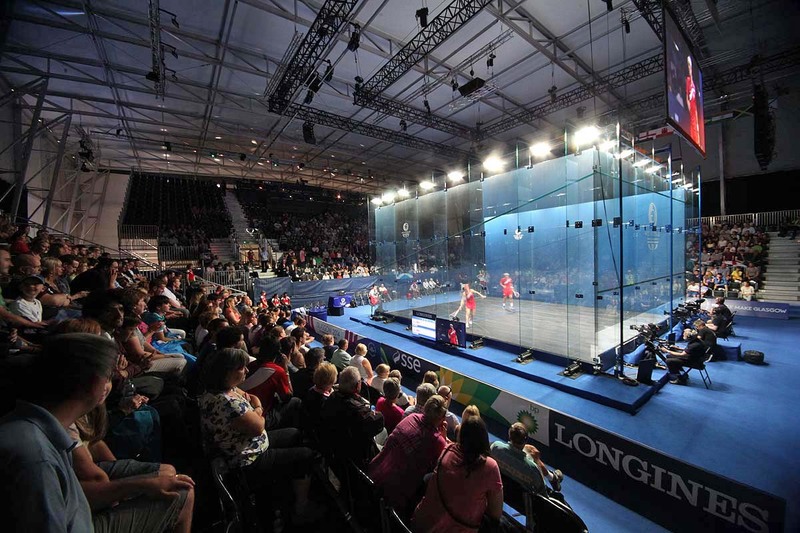 It was a performance which saw the likes of Olympic medallists Matthew Pinsent, Daley Thompson, Joanna Roswell and other sporting icons such as Gary Lineker and Michael Vaughan take to Twitter to voice their appreciation and respect for squash. 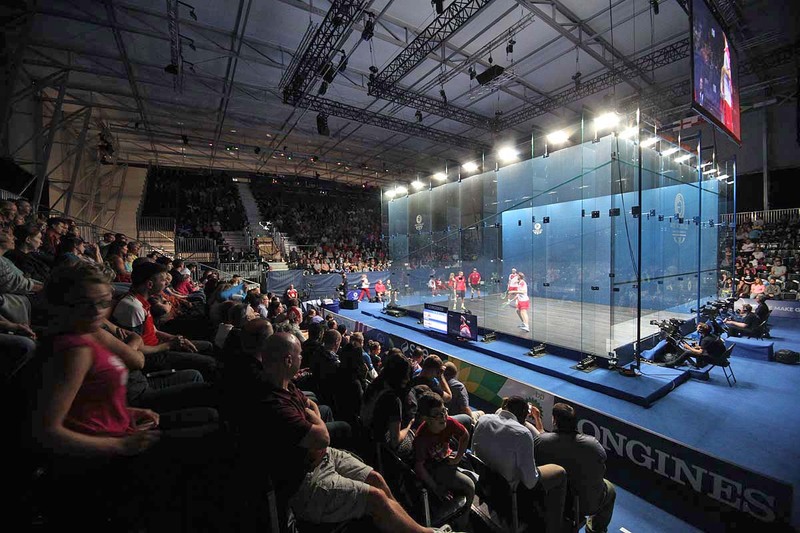 "The finals of both the men's and women's singles at the Commonwealth Games displayed the passion, dedication and competitiveness which demonstrates precisely the kind of attributes that make squash a perfect fit for such a global sporting platform," said Professional Squash Association Chief Executive Alex Gough. "The BBC's coverage of the action during the Commonwealth Games so far has showcased the sport in a fantastic light, following their broadcast of the 2013 World Championship on the Red Button last November, and to see such strong figures for the event is a boost to everyone involved in the sport. "It's testament to the temperament and talents of all four finalists, and all the competitors in the Commonwealth Games, that the sport is currently riding high on a wave of high-profile public support." Complete draws will be published on 17 July.